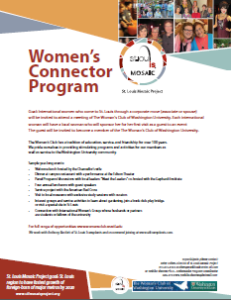 St. Louis Mosaic Project and the Woman’s Club of Washington University in St. Louis have teamed up to present the Women’s Connector Program. As a result, this initiative presents an opportunity for international women to connect with local women and activities. Because of a tradition of education, service and friendship, the Woman’s Club provides programs and activities for members throughout the year.